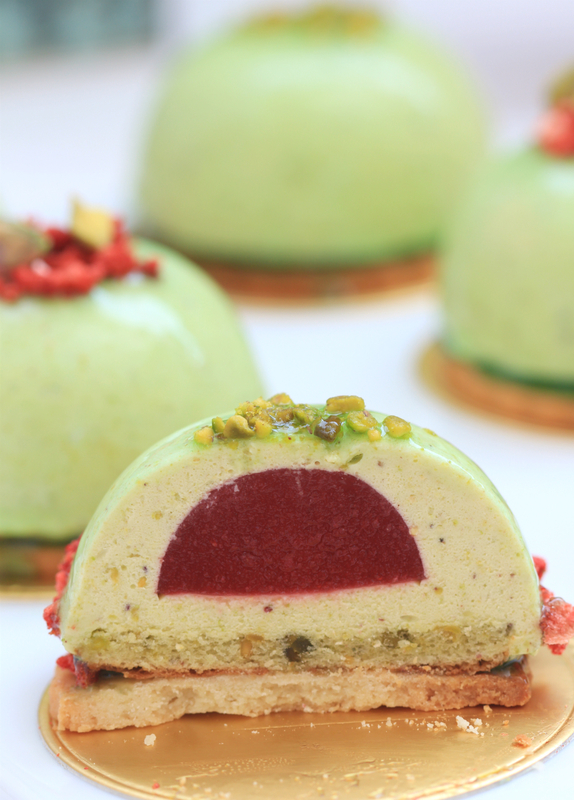 my bare cupboard: Pistachio-raspberry petit gâteaux "
Entremet is basically a multi-layered cake with various complementary flavours and textures (Pâtisserie/William Curley). 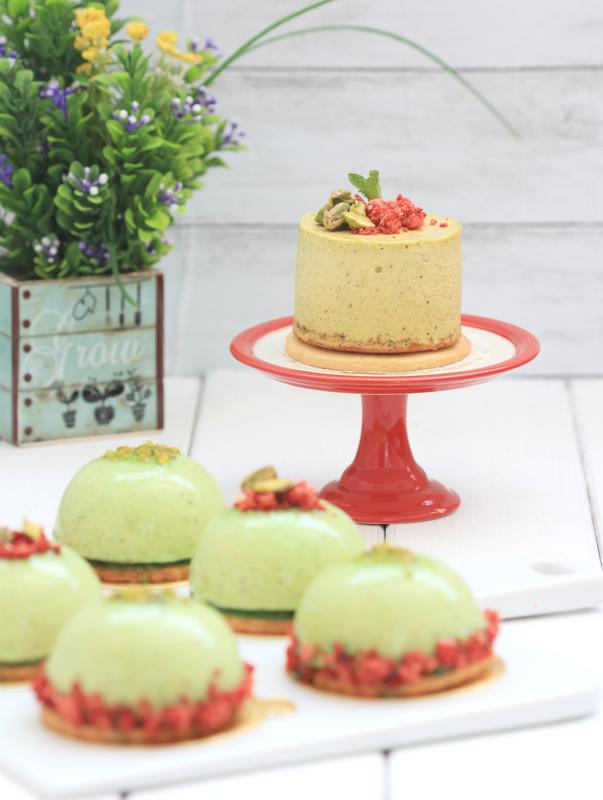 This mini cake is made of 5 components, a pâte sablée base, pistachio joconde, pistachio mousse, homemade raspberry jelly and store-bought neutral glaze. For the pâte sablée cookie base, I tried the recipe which I tweaked a bit, from Chef Antonio Bachour that I've seen from his Facebook page. Almost the same as the recipe from Cookpad that I use from time to time. This is a pâte sablée with almond powder so it taste so much better. For the pistachio joconde, I used my favourite recipe from the Pâtisserie book. Joconde sponge or biscuit Joconde is a light almond sponge cake, baked in thin layers and mostly use as a base or linings for layered cakes such as entremets. It is named after the famous painting, Mona Lisa which is called La Joconde in French. For the pistachio mousse, another tweaked recipe from my fave bilingual cookbook author and chef, Charles Ho. Omitted both almond extract and custard powder because I don't really like the taste. You can make 8 pieces dome-shaped cakes from this recipe. As I only have 1 silicone mould, I used a mini mousse ring for the excess mousse; I chilled it instead of freezing as it's faster to unmould. Colour of the un-glazed pistachio mousse is lighter in real life. The amount of the mousse will nicely fit in a 6x2-inch mousse ring, just guesstimate the amount of jelly insert so as the thickness of the sponge. Raspberry pairs really well with pistachio so I made raspberry jelly as insert for this gateaux. You can use strawberries or blackberries if prefer. The glaze is just a simple 3 ingredients neutral glaze. You can make a homemade version if you can find pectin NH, note that it is different from the pectin which is mostly use in jam making. The recipe is again from Chef Antonio Bachour's facebook page. The glaze though is a bit disappointing, not really sure if it is the brand that I used or the very hot weather, it keeps sliding as you can see from the photos. The 250 grams neutral glaze and 30 grams water with a bit of green food colour is good enough for 6 mini cakes. Decorations are just freeze-dried strawberries (both fresh and freeze-dried raspberries are too expensive for my taste) and some crushed and whole pistachio kernels. * Preheat oven to 200ºC. 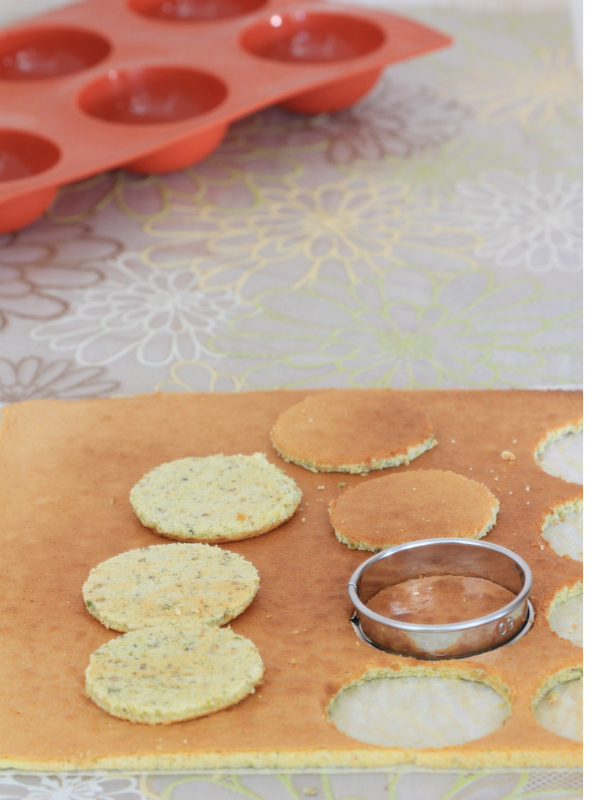 Line a 12-inch square pan with parchment paper or silicone mat. * Combine icing sugar, flour, pistachio and almond powder in a mixing bowl. Add the whole eggs and beat until ribbon stage, about 10-12 minutes. * Melt butter and slowly add it to egg mixture, mix well to combine. * Beat egg whites and sugar until stiff peaks form. Fold meringue into the egg mixture and spread evenly into the prepared pan. Bake for about12-15 minutes until golden brown. * Let cool completely before using. * Cut out 6 pieces of joconde using a 6-cm (metal) ring/cutter and one 7-cm round for the excess mousse. 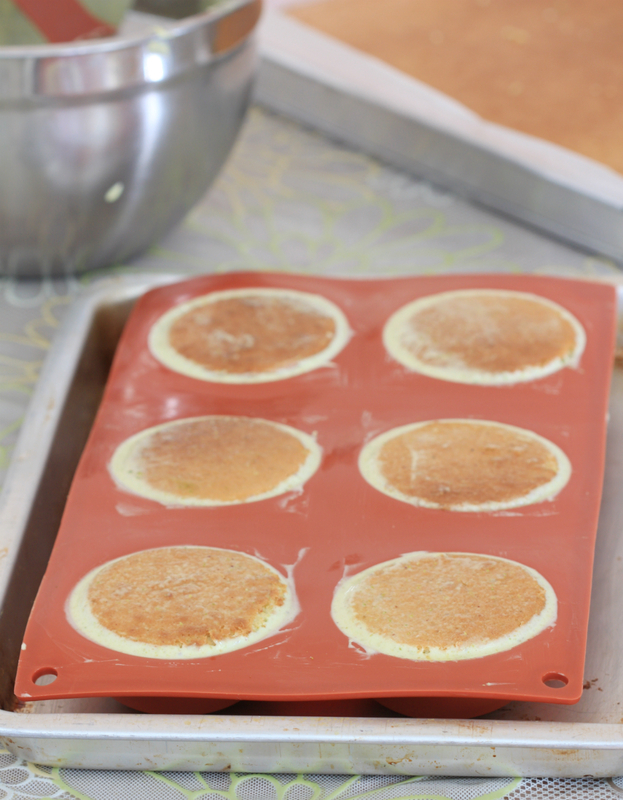 * Soak gelatine sheets in cold water until soft, squeeze off excess water and set aside. * In a small saucepan, bring the purée, sugar and water to a boil, stir until sugar is melted. Turn off heat and add in the softened gelatine, stir until gelatine is completely melted. Transfer to a heat-proof cup and let cool slightly before pouring onto the silicone mould. * Soak gelatine sheet in cold water until soft, about 5-10 minutes. Squeeze off excess water, set aside. * Whisk cream until it has the consistency of a thick yogurt, chill in the fridge until needed. * Whisk yolk and sugar in a mixing bowl until light in colour. Pour in milk and place bowl on top of a saucepan with simmering water. Stir constantly until mixture has reached to about 165ºC. Mixture has the (almost) consistency of evaporated milk. Turn off heat, add in the softened gelatine, stir until gelatine is completely melted. Stir in the pistachio paste and mix until well-combined. * Fold in the whipped cream and mix well. 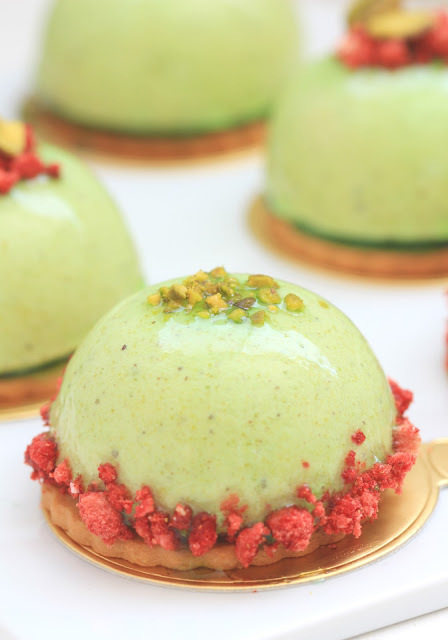 * Fill in the 6-cavity silicone mould with pistachio mousse, about three-fourths full. 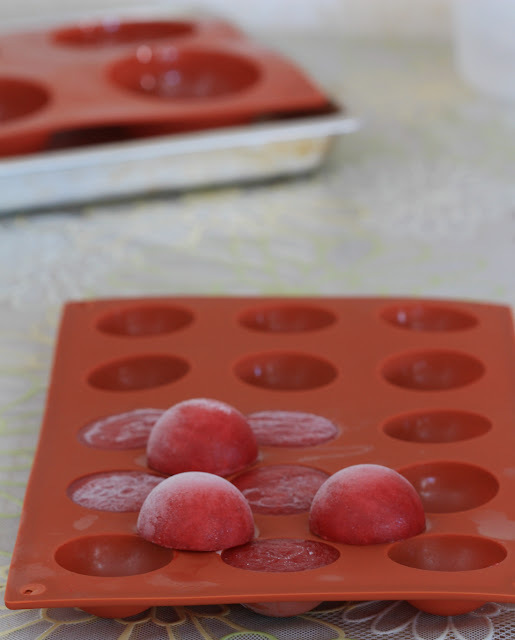 Gently press down the raspberry jelly on each filled mould, top in with a bit more mousse to cover the jelly. Place the joconde sponge on top , gently pressing down; fill in more mousse along the sides of the biscuit. Use an offset spatula to smoothen the top. Assemble remaining jelly and mousse in a 7x5-cm mini mousse ring. Freeze mousse in silicone for at least 8 hours and place the one in mousse ring in the fridge. * Preheat oven to 170ºC. Line baking sheet with silicone mat/parchment. dough. Gently knead 4-6 times until smooth, pat dough into 6-inch square and wrap in plastic wrap or parchment paper. Chill for 2 hours or overnight. 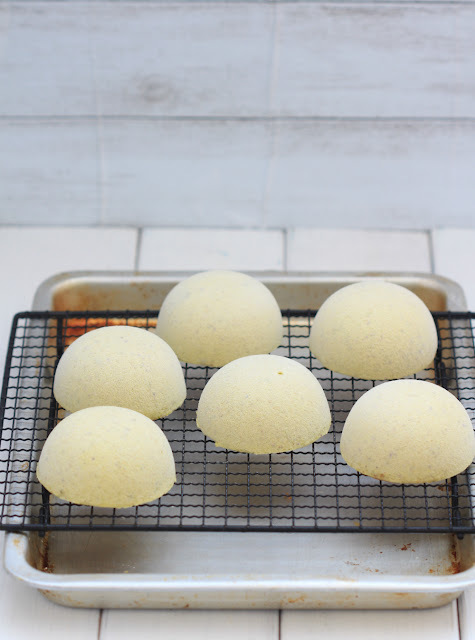 * If the dough is a bit firm to roll, let stand for about 2-3 minutes, depending on ambient temperature. Roll dough between 2 sheets of parchment paper to 3-mm thick, chill in the fridge for about 20 minutes if the rolled dough turns a bit soft. Use a 2 1/2 fluted cutter (3-inch is better) to cut 6 pieces and one 3-inch round. Use some small cutters for the excess dough. 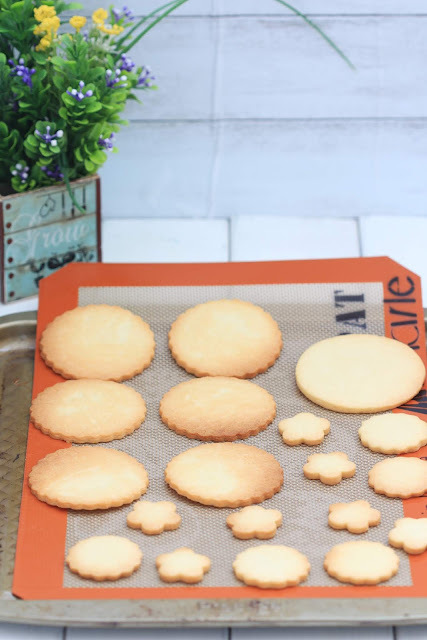 * Place cut dough into the prepared baking sheet and freeze for 1 hour before baking. * Bake for 14 to 20 minutes until lightly-browned. * Cool completely before using. * Combine glaze and water in a small saucepan and bring to a boil. Transfer to a heat-proof cup and stir in the food colour. Let cool to 100ºF before using. 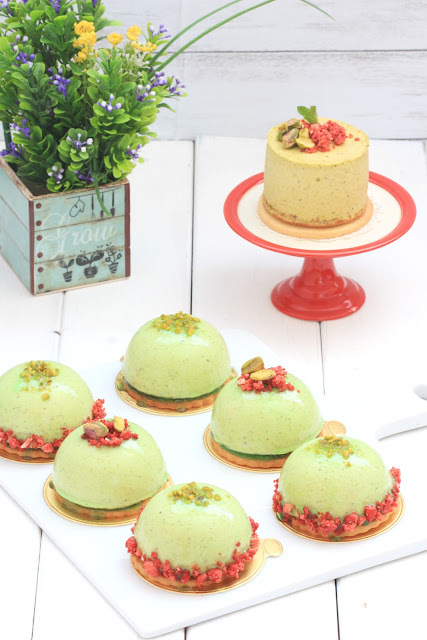 * Unmould pistachio mousse and place on a wire rack, place rack on a plastic wrap-lined ( for easy clean up) baking sheet and freeze for another 30 minutes before glazing. * Glaze frozen mousse, chill in the fridge for about 20 minutes for the glaze to set. Take out glazed cakes and transfer to a cake holder, place back in the fridge and let de-frost for about 2 hours before decorating. * Serve straight from the fridge. 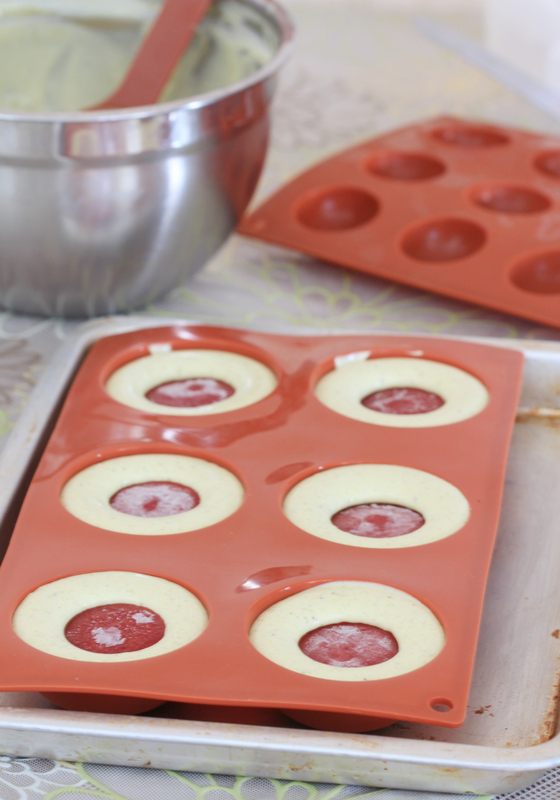 * Store petit cakes in an airtight container and place fridge. Consume within a week. Labour of love...but they do look so beautiful and heavenly!